"Picture it...Sicily 1923.." Just kidding. If you did get that Golden Girls reference you and I would make great friends :). Back to what I was saying. Picture it, you're at a store like Target or Walmart, and you've done your weekly grocery shopping. When you're done getting your groceries you can't help but take a quick glance at the nail polishes in the cosmetic section. That's when you spot it. You found a pretty nail polish. You don't necessarily need it at the moment, but the fact you're spending money on groceries anyways gives you permission to add just an extra 7 or so bucks to the tab. Have you been in that position? I was last weekend. I spotted the end cap of some fall polishes at Target. I saw they had those Sally Hansen Complete Salon Manicure Prabal Gurung Fall Fashion Week colors. To be honest, most were drab and boring, but then there was this glistening shimmering pretty called Gilded Lily that I figured "What the heck? ", and threw it in along with my zucchini, Cheerios, and deli sliced turkey meat. I'm glad I did. Gilded Lily is a dense mixture of warm gold and copper glitter flecks in a clear base. I'm not sure what the correct term for the type of material this is in it. It's not really a glitter like how we'd think of a glitter. It's not a flakie. You know the glass fleck stuff in some polishes? It's like that but with out a base color. So, I'm calling them flecks. Whatever it is, it is gorgeous. You know when the sun hits water and creates that golden scattered effect? This is that in a bottle. It's very easy to build too. This was 3 coats, and if you look closely you can kind of see my nail showing through, but I only noticed that in the photo. In person, it's so shimmery and blingy you can't see your nail at all. This is a beautiful polish. I definitely recommend you check this one out. LOL, I know what you mean, a bit difficult to decide what it is - but pretty for sure!! Cute polish! And LOL at the Golden Girls reference - my little sister loves that show so I know all the episodes! This is so pretty- as if I didn't have enough coppery/golds already, but I can already tell this will be coming home with me if I spot it. I would like to know what the name of this finish really is...I have a # of 'em like this - I see 'em called foils and shimmers but this does not seem to fit...however I think of the range shimmers have covered since they first appeared in the late 80's...in fact back then when OPI got started they had to put a S or F on the color info to let you know if it was a shimmer or a Frost - you pretty much could not tell a difference early on always...and some of the shimmers were so hidden in others they looked like cream finishes! 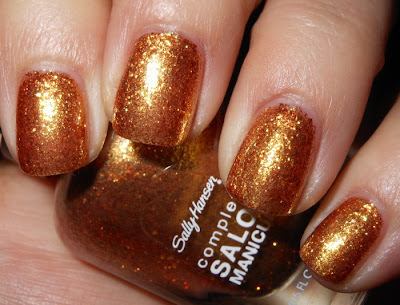 So maybe I would put this in a shimmer category just 'cause of all the variety that encompasses.